At the 2000 Olympics sprinter Marion Jones raced into the history books as the first woman to claim five medals in a single Games, three of them gold. Overnight she became athletics's golden girl, appearing on the cover of Vogue and piling up the cash to become one of the sport's first female millionaires. Eight years later, Jones is headline news again - sentenced to serve six months in jail for lying to investigators after admitting her golden achievements in Sydney were fuelled by steroid abuse. After years of vehement denials, Jones, flat broke and stripped of her gold medals, came clean at last and paid the price. "I have no-one to blame but myself for what I've done," she said after her confession. "Making the wrong choices and bad decisions can be disastrous." As a naturally gifted athlete, Jones did not knowingly choose drugs at first. Then drugs seemed to dog her throughout her career. As five-time Olympic gold medallist Michael Johnson put it, "the people she has surrounded herself with have been involved in some of the largest drug scandals in the sport". Even back at her California high school in 1992, the 16-year-old Jones missed an out-of-competition drugs test but escaped punishment at a hearing. Her mother had seen to that by hiring Johnnie Cochrane, who successfully defended OJ Simpson on a murder charge. After storming to her first global 100m title at the 1997 world championships in Athens, Jones married shot putter CJ Hunter. Hunter, who first met Jones at the University of North Carolina, then introduced the sprinter to a new coach, Trevor Graham. Graham's technical improvements paid dividends and Jones, now a double world 100m champion, went to the 2000 Olympics on a wave of hype and in peak form. But just one day after winning her first gold in the 100m final, news surfaced that Hunter, who had already withdrawn from the Games, had tested positive four times for banned steroid nandrolone. The marriage between the triple Olympic gold medallist and Hunter quickly disintegrated, but Jones carried on working with Graham and new nutritionist Victor Conte. 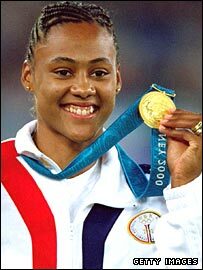 To supplement her training for the 2001 Worlds, where she won 100m silver and 200m gold, Jones was slipping tablets provided by Conte's Bay Area Laboratory Co-Operative (Balco) under her tongue. At first she thought she was taking flaxseed oil but during her District Court confession Jones told the judge, "By November 2003, I realised he was giving me performance-enhancing drugs". In June of the same year, Graham had blown the lid on Balco when he anonymously sent a syringe of previously undetectable steroid THG to the US Anti-Doping Agency (Usada). 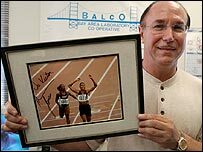 That September, raids on Balco's headquarters in San Francisco linked Jones's name to doping schedules, purchases and blood test results - and clouds of suspicion around the sprinter grew. But when Jones appeared in front of a federal grand jury investigating Balco for distributing steroids in November, she claimed she had never taken performance-enhancing drugs. Despite her own resolute position, the federal investigation continued to bring nothing but bad news for Jones. Her boyfriend Tim Montgomery, the father of her son Monty and at that time the world 100m record holder, was accused of doping violations based on the inquiry. Montgomery and Jones had already raised eyebrows by training for the 2004 Olympics with Charlie Francis, the coach of Ben Johnson, the Canadian who had been stripped of the 1988 Olympic 100m title after testing positive for steroids. Jones left Athens with no medals to her name, and just before Christmas, Conte appeared on national television claiming he had watched Jones inject herself with human growth hormone and that he had given her five different performance-enhancing drugs before, during and after the 2000 Olympics. The International Olympic Committee (IOC) immediately launched an investigation into doping claims against Jones based on Conte's revelations. Suspicion gathered tighter around her, but safe in the knowledge she had never failed a drugs test, she held her head high - and sued Conte for defamation. By March 2006, Conte was out of prison after serving a four-month sentence for supplying steroids, Graham would soon face charges of lying to federal agents, Montgomery, now estranged from Jones, was serving a two-year ban - and Jones was on the comeback trail. In her first appearance in 11 months, the 30-year-old ran the 100m in 11.06 seconds in Veracruz in May, won the US championships and stated her greatest desire was to compete at the 2008 Beijing Olympics. In August, Jones's comeback came to a grinding halt when news leaked that for the first time in her career - after more than 160 tests - she had failed a drugs test. Jones had tested positive for blood-boosting drug EPO at the US trials in June. Jones said she was "shocked," but her luck appeared to have run out. As it was, a negative "B" sample saw an ecstatic Jones cleared. Life went on; Jones married Barbadian sprinter Obadele Thompson and the couple had their first child in July 2007. But in October of last year, an emotional Jones pleaded guilty to lying about her steroid use to US investigators, admitting that she had taken steroids ahead of the Sydney Games. She retired from the sport and the IOC stripped Jones of her five Olympic medals and erased the American's results dating from September 2000. In 1984, a nine-year-old Jones had written "I'm going to be an Olympic champion" on her bedroom blackboard. But for jailed Jones her Olympic dreams, past and present, are well and truly over.